Hello blog. It’s good to see you again! A new work schedule has kept me away from the keyboard, but an unscheduled day off, a rainy morning, and a blog carnival prompt has me writing. About a month ago, Kelly asked the question on her blog, “How do you keep the disease from taking over?” It’s a great question and one that I thought of quite a bit when I first read her post. A gentle nudging tweet from her yesterday reminded me to write and participate in her latest blog carnival. So here are a few of the things (a non-inclusive list) that help Kim and our family deal with rheumatoid disease. How do we — our family — keep the disease from taking over? First off, thank you, thank you, thank you, Netflix. I know it might seem funny, but it’s also very true. I don’t what this would be like for Kim without Netflix streaming. Kim is not a big reader and she doesn’t find a distraction from her pain from browsing the internet either. But streaming TV shows and movies on demand? That is extremely helpful! See there are days that come without warning where Kim literally does not have the energy to leave the bed. Sometimes those days run into multiple consecutive days and that is when Netflix is so helpful. I seriously can’t imagine dealing with RD without it. Next is blankets, gloves, and Thermacare heat patches. Our kids have always been involved in sports. More specifically, outdoor sports. In Wisconsin. Which means that we can and have left for baseball games when it was 60 degrees outside only to finish the last inning with a temperature of 22. So we know we need to be prepared. We are not willing to let RD dictate to us whether Kim can watch the kids participate in sports or not. Therefore, the back of our van is loaded up with a chair that Kim can sit in for several hours (bleachers are out of the question without an excellent quality bleacher seat), about 6 blankets, gloves, and these lovely heat patches. 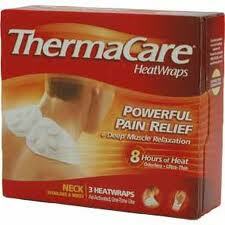 Kim places one of these heat patches across her shoulders when we know we will be sitting out in a cold game. They help to keep her warm which prevents her from tightening up her neck and shoulder muscles from the cold. That it turn helps to keep her pain levels lower. Our family also helps us from letting the disease take over. Often, Kim’s RD has her in bed much more than she would like. This is not in any way easy for the woman who would prefer to be busy working, cleaning, and gardening 18 hours every day, but I am seeing the benefits of these forced moments of rest. Almost every night when it’s time for me to go to bed I have to kick one or two or all three of our teen-aged children out of our room. Daily, they lay next to her and talk about their lives and Kim gets to listen and communicate with them. What mother wouldn’t love to have time to talk with children without distractions and life’s busyness interfering? What a tremendous gift that has been given to her because of RD! Lastly, our friends help in more ways than they realize. Not a week goes by without multiple people asking us how she is feeling. And then they tell us they are praying for us. Words cannot fully express what that means to us. Their concern for our family has done multiple things, but probably nothing that is more important than the binding of our hearts together with theirs through friendship. There is something unspeakably priceless that comes with knowing that someone cares so much for us that they regularly take time out of their day in order to pray for us. It’s one thing to see one’s own hurts and pain and to ask God for help. But to care so deeply for another that their suffering becomes more significant than your own needs speaks volumes. The Psalms tell us to “cast your cares on the Lord”, but our friends have made our cares their own and for that we are deeply grateful. One other thing our friends do for us is that they give us hope. When we are frustrated by doctor’s visits and poor treatment from medical professionals, our friends are frustrated too. This gives me incredible hope. Why? Because our friends get it. They understand that there are huge issues with how the medical community currently “sees” patients with RD. They share in our disgust when a doctor tells Kim her pain is “subjective”. (More about that in a future post.) But how does our friends “getting it” give me hope? Simple. Because if they understand it, then others can too. And as we continue to educate, fight for awareness, and show people the realities about RD we move another step closer to a cure. Each new person that gains a better understanding of what RD really is helps us take one more step in that direction. And each step helps us all keep the disease from taking over. This post was written for RA Warrior’s RA Will Not Win blog carnival. Please check out the other great posts written for this carnival at RA Will Not Win. Your paragraph about being in bed and seeing your teenage kids sharing time with their mother hit me in the heart and brought tears to my eyes.I too am a mother with severe RD.I too am blessed to spend time with my 17and13year old in those moments when we are all sprawled on the bed deep in discussion..It took your words to show me that this is a blessing to me. When you are in the middle of this terrible disease you can go days,weeks,and months without seeing the blessings. Thanks for giving me that picture!!! That’s such a great post Eric. Your family and friends are so strong in their support. I can’t wait to hear the post about the “subjective pain”. It can so damaging when medical personnel use that label. Great post, Eric – thanks for sharing! Next winter, I may have to invest in those heat patches for outdoor activities 🙂 I love how you always pull out the blessings that trials provide, too!